1. Be aware of the wind. The tee shot is from east to west. The faiway is about 35 yd wide Dogleg slightly to right, down hill, Water hazard at left from 150 yd. Faiway bunder a left and right at 220 yd, A Tree in the middle of faiway at 320 yd could be a target. 2. 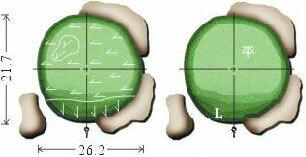 The green size, bunker, grain, andbreak, are in the picture. 3. Landing area and Strategy suggestion are in the picture. 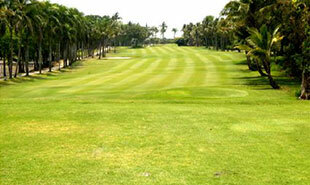 The yardage tree refers the distance to the center of green The Yardage is from the Pro tee.